This article is designed to assist those responsible for either drafting corrosion protection specifications, or as contractors with a requirement to meet that which is specified. The information provided is based upon industrial experience, and is in the form of current practice tables of ‘standard’ corrosion protection systems for steelwork in a range of environments. The tables of ‘standard’ systems for steelwork presented in this article relate to ‘environment categories’ which are based upon those given BS EN ISO 12944-2 and BS EN ISO 9223, which are described in the table below. a The thickness loss values are after the first year of exposure. Losses may reduce over subsequent years. The loss values used for the corrosivity categories are identical to those given in BS EN ISO 9223. In many instances, steelwork will be in a warm dry interior where it will not corrode, and the structural stability of the building will not be threatened during its design life (generally taken as 50 years). In such conditions (classified as C1) no corrosion coating is required. Examples include steelwork inside dry buildings with neutral atmospheres such as multi-storey office buildings, shops, schools, hotels, residential buildings, airport terminals, and hospitals, etc. However, when steelwork is exposed to moisture, corrosion will occur at a rate depending on the severity of the environment. 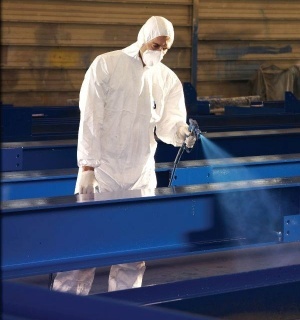 In such cases, a coating system appropriate to the environment category should be provided. Note that some buildings may contain areas where different environment conditions apply e.g. hospitals would normally be C1, but may contain kitchens and laundry areas that would normally be C3. Some types of buildings, such as car parks may fall into any of the above categories or combinations of them depending upon their location, design and construction. Higher risk categories for interior environments (e.g. C4 and C5) are not covered in this article and users are advised to seek specialist advice if their project involves such situations. The period of reasonable freedom from severe corrosion of the steelwork that might lead to weakening of the structure. This figure assumes no mechanical damage in service that no maintenance is carried out and that up to 1mm of steel may be lost from the surface at the corrosion rate for each environment given in BS EN ISO 12944-2. Visible steelwork will normally be accessible for maintenance and if repainting is carried out the quoted structure life will be extended. The expected period to maintenance of the protective coating. More frequent re-coating may often be preferred for decorative reasons because of fading, contamination, wear and tear, etc. Hidden steelwork is assumed to be not accessible for maintenance, thus a figure for coating life of hidden steelwork systems is not applicable. The thickness values given for primers are the total thickness used and may include a prefabrication primer. For example, 80µm can be in one coat or as 20µm prefabrication primer plus 60µm post-fabrication primer. MIO - micaceous iron oxide. The thickness values given for primers are the total thickness used and may include a prefabrication primer. For example, 80µm can be in one coat or as 20µm prefabrication primer plus 60µm post fabrication primer. A ‘wetting’ low viscosity primer is recommended to obtain satisfactory performance. For steel profiles over 6mm thick the minimum average thickness of galvanized coatings to BS EN ISO 1461 is 85µm. To enhance durability and improve the aesthetic appearance, the hot-dip galvanized coating can be treated with a mordant wash or ‘T’ wash followed by a vinyl primer at 40µm and a vinyl finish at 60µm. The Coating Life is estimated for the paint system only and does not include the hot-dip galvanized coating. The life of the total protection system without maintenance should exceed 25 years, however, it is anticipated that for aesthetic reasons maintenance will be carried out at periods of 10 years or less. For steel profiles over 6mm thick the minimum average thickness of galvanized coatings to BS EN ISO 1461 is 85µm. For hidden steelwork, e.g. behind a suspended ceiling, no further treatment is required. For steelwork that is visible, the galvanized coating should be surface treated and coated as shown. Mordant wash or 'T' wash, which is the brush application of a chemical solution that reacts with the galvanized surface. The effectiveness of the solution is readily visible and untreated areas are self evident. After treatment, the solution should be rinsed off with clean water and then the treated surface dried ready for painting. It is important that the manufacturers' instructions are carefully followed to ensure successful results. Sweep blasting, which is the use of low pressure fine grade non-metallic abrasive which can be very effective but requires care and expertise. The treatment should slightly roughen the galvanized surface without removing the coating. 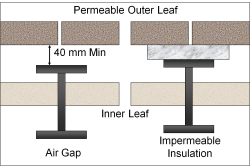 Coating system durability given in the following tables is based on practical experience. It is the expected life, in years, before first major maintenance. This is taken as degradation level Ri3 from BS EN ISO 4628-3 (1% of surface area rusted). It should be noted that this does not imply a guarantee of life expectancy. The durability of galvanized steelwork is derived from the figures in BS EN ISO 14713. Where painting of galvanized steelwork is required for aesthetic or other reasons; suitable systems from BS EN ISO 12944-5 may be used. It should be noted that the colour range of MIO is limited. The zinc rich primer applied at 80µm would increase the durability of the system by approximately 5 years. 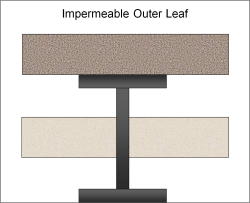 The primer coat may be omitted providing the build/intermediate coat is applied directly to a clean steel substrate of suitable surface profile. With time, elastomeric urethanes may suffer from superficial degradation known as ‘chalking’ which changes the visual appearance but does not affect the over all durability of the system. Where colour stabilization is required for appearance purposes, this can be achieved by the application of the finish coat in this system. The protection of structural steelwork against atmospheric corrosion by thermal sprayed aluminium or zinc coatings is covered in BS EN ISO 2063-1 and BS EN ISO 2063-2. 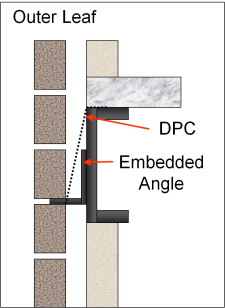 For wall cavities in which steel will remain dry, either by use of an impermeable outer leaf or where there is physical separation of the steel from the outer leaf, a system from the ‘Hidden steelwork’ section for environment categories C1, C2 or C3 may be appropriate. The treatment specified for cavity wall condition should also be suitable for the interior environment of the building. Should the internal environment be more aggressive, additional protection will be required. The environment within a ‘normal’ cavity wall construction is categorised as being C2. The system PW-C2-S is considered appropriate for such conditions. 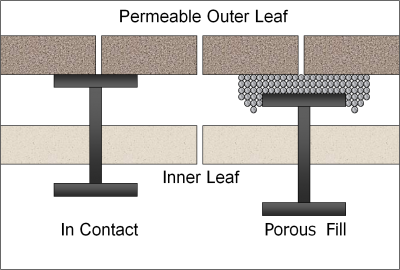 However, where steelwork within the cavity is deemed to be in a more aggressive environment category, the application of a high build bitumen coating at 150µm to the faces of the steelwork within the cavity may be applied before or during construction. Brickwork cladding or other masonry, can develop cracks and leakage over time. When steelwork is in contact with, or embedded in a brick/masonry outer leaf, one of the following systems should be used. In some regions, stainless steel may be required for embedded members by local regulations or be deemed necessary to provide adequate durability. Specialist advice should be sought. Steel Buildings, 2003, The British Constructional Steelwork Association Ltd.
D.Deacon & R.Hudson (2012), Steel Designer’s Manual (7th Edition), Chapter 36 - Corrosion and corrosion prevention, The Steel Construction Institute. D.A. Bayliss & D.H.Deacon (2002), Steelwork Corrosion Control (2nd edition), Spon Press.